Product Characteristics: Light Yellow or Light Green Liquid. Our grape seed oil is also called grape seed oil or grape oil, which is 100% pure natural products pressed from the seeds of various varieties of Vitis vinifera grapes. Grape seed oil is used for salad dressings, marinades, deep frying, flavored oils, baking, massage oil, sun bum repair lotion, hair products, body hygiene creams, lip balm and hand creams. Grape seed oil was not produced or used on a large scale until the 20th century, largely because grape seeds contain a lower percentage of oil as compared to other oil-producing seeds, nuts, or beans. 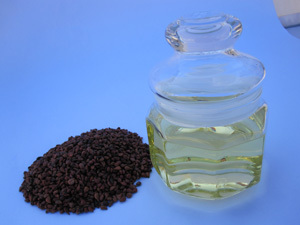 Grape seed oil is extracted from grape seeds and has a relatively high smoke point, approximately 420�H(216℃). So it can be safely used to cook at high temperatures. Grape seed oil can be used for stir-fries. In addition to its high smoking point, grape seed oil has other positive attributes in relation to cooking. It has a clean, light taste that has been described as "nutt". Because of its "neutral" taste, grape seed oil is often used as an ingredient in salad dressings or as a base for infusing or flavoring with garlic, rosemary, or other herbs or spices. It is also used as an ingredient in homemade mayonnaise. One is able to use less grape seed oil for precisely the same reasons that the cosmetics industry likes it, the emollient and filmfroming virtues. In all products grape seed oil is a preferred cosmetic ingredient for damaged and stressed tissues, possessing regenerative and restructuring qualities which allow a better control of skin moisturization. It can help skin retain the normal structure of epithelium cells and nerve cells via supporting the cell membranes. (Citation needed) It is noted to be especially effective for repair of the skin around the eyes. Used as an all-over skin moisturizer, grape seed oil is known to reduce the look of stretch marks. A light, thin oil, grape seed oil leaves a glossy firm over the skin when used as carrier oil for essential oils in aromatherapy. It contains more linoleic acid than many other carrier oils. Grape seed oil is also usable as a lubricant for face shaving. Grape seeds contain antioxidants (polyphenols, including proanthocyanidins), which show some health benefits. In particular, sufficiently high amounts of resveratrol occur that it can be extracted commercially. Despite this, these antioxidants are not likely to be present in significant amounts in the cold-pressed grape seed oil itself, since proanthocyanidins are polar molecules and therefore insoluble in lipids. Antioxidants from grape skins and seeds are more concentrated in products such as grape juice and red wine. In a study presented in 1993 at the American College of Cardiology Scientific Session, Nash and colleagues showed that up to 45 g(1.5ounces) of grape seed oil per day raised HDL-C levels by 13% and reduced LDL levels by 7% in three weeks. The total cholesterol/HDL ratio fell 15.6%, and the total LDL/HDL ratio fell 15.3%. We also product and export all kinds of oil countries including Wheat Germ Oil, Grape Seed Oil, Flaxseed Oil (Linseed Oil) Almond Oil, Walnut Oil, Evening Primrose Oil, Borage Oil, Rose Hip Oil etc. we have passed evaluation of ISO9001:2000 and HACCP certification and established steady marketing channels with customers from Asia, Africa, East Middle and South America. We are very glad to take this opportunity to establish business with you.